Property characterization and division is an issue in nearly every divorce in San Diego. Any property acquired during marriage by either party will be characterized upon divorce as community property or separate property. Community property consists of all earnings and accumulations of either spouse from the date of marriage to the date of separation. Separate property consists of all property acquired prior to marriage, after separation, or during marriage by gift, devise, or bequest. Community property is equally divided between the parties upon divorce and each party generally takes all of their separate property. This typical division process becomes more complicated when the parties mix community and separate assets. In California divorce proceedings, the court will presume that all property acquired during marriage is community property. When a party argues that funds or an asset is separate property, it is his or her burden to rebut the community property presumption. Divorce attorneys frequently answer the question: “How do I trace the property I owned before marriage?” In order to rebut the community property presumption, a spouse must “trace” any separate property into an existing asset. There are two methods of tracing acceptable by the court: (1) direct tracing and (2) exhaustion method/family expense presumption tracing. If a particular asset trace is complicated, many parties to a divorce will often hire a financial expert to perform the tracing and testify in court on their behalf. If a party can trace separate property contributions to the acquisition or improvement of community property, that party will be entitled to a reimbursement as long as no written waiver was executed. This means that if Husband takes separate property funds inherited from his parents and improves the community residence by putting in a pool, his attorney will advise him that he would be entitled to a reimbursement. However, if Husband signed a waiver relinquishing any right to a reimbursement, he will not be able to receive one from the court. Husband could provide a direct tracing by providing the court with bank statements from his separate property bank account which evidence all expenses incurred to install the pool. This would illustrate a direct link from a pure separate property source to a purchase during marriage. Merely showing that separate property funds were available is insufficient to provide a direct tracing. 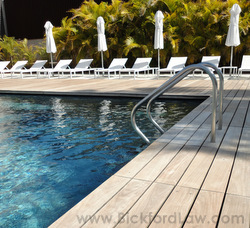 Husband’s divorce attorney must show that his separate property funds were used to install the pool. If Husband is unable to perform a direct tracing because he commingled his separate property inheritance with the parties joint bank account, his attorney might be able to perform a tracing through the exhaustion method/family expense presumption method. Under this theory, in order to establish that property which was purchased from commingled funds is separate property; Husband must show that at the time of acquisition, all community funds were exhausted by community expenses. The court will presume that any community expenses paid from a commingled source were paid with community funds. The presumption is that Husband would preserve his separate property funds rather than use them to pay community expenses. Therefore, if the community had $5,000 in a commingled account and Husband deposited $10,000 from his separate property inheritance then paid $5,000 of community expenses, the court would presume the remaining $10,000 in the account is Husband’s separate property. If, while the account still had a $10,000 separate property balance, Husband installed a pool in the backyard of the community residence using money from the joint account, Husband would likely be entitled to reimbursement. Property division and characterization is a complicated matter. Whether you held property before you were married or had substantial funds prior to marriage, the advice of an experienced divorce attorney can be invaluable. Please contact us if you are considering a divorce from your spouse, a legal separation, or have questions with respect to tracing your separate property. Nancy J. Bickford is the only attorney in San Diego County representing clients in divorces, who is a Certified Family Law Specialist (CFLS) and who is actively licensed as a Certified Public Accountant (CPA). Don't settle for less when determining your rights. Call 858-793-8884 for more information about the consultation process.